I told the students the story of a friend of mine who was doing some painting at home — that he used 2 cans of paint to cover 1/2 of the room. I posed the question, “At this rate, how many cans of paint will it take to paint the whole room?” Pretty quickly there was consensus that 4 cans would be needed. An easy start. Everyone agreed, not much discussion. We modeled it in on the ratio table. Next — in another room —my friend used 2 cans of paint to cover 1/3 of the wall. I posed the same question, “How many cans of paint will it take to paint the whole wall now?” Some students right away while others needed to think about it. This time, I asked students to describe their thinking and a picture of the situation emerged. “I drew the wall, then I split it into thirds. Each third took 2 cans and there are 3 thirds. So 6 cans,” they explained, as I drew a model of the wall. Several students nodded and agreed. I asked who could explain the picture again and had two students reiterate. There was consensus so we were ready to move on. More nods, but not everyone was convinced. Then another student referred us all back to the last visual to show us that it served as a model for this problem, too. Two of the three sections of the room are painted and that also represents 4 cans (2 cans in each one third), so it’s the same answer, 6 cans. Finally, I told them that in the next room my friend used 1 can of paint and realized she had painted one fourth of the wall. Most hands immediately went up and there was consensus that a rectangle, split into four equal sections could represent the wall. Each section could have a 1 in them — representing 1 can of paint — and therefore, entire room would take 4 cans. At this point, I felt that the students seemed generally comfortable. So I wanted to make a clear and explicit connection between this ratio relationship and division. I simply told them that one way we could represent these relationships and calculations we were doing was by showing them as division. This got kids thinking. Pauli noticed that for most of the problems we had done, you could figure out the answer by multiplying the whole number by the number in the denominator. Students looked to our ratio table to see if this was true. Sammy extended this idea, noting that it worked for all of the numbers in which the numerator was 1. I asked everyone to take a minute, think on their own about Pauli and Sammy’s ideas, and then turn to their partner to put these ideas in their own words. Nearly everyone in the class appeared to be very comfortable talking about the relationship they just heard about. But then, the conversation then took two different directions — first Erin said, “Yes, I see the pattern and I believe that it’s true. But the question is, why?” Could we ask for anything more? What a wonderful question. This was something the classroom teacher and I would love for all students to question and all students to make sense of. Then Hope shared that in problem 4 ÷ 2/3, the answer was half of what you’d think it would be if you just multiplied the whole number and the denominator (4 x 3 = 12). She decided if she used the 2 (the numerator) to cut the answer in half, then she was back at what she already knew to be the correct answer. More interesting relationships — thinking about division as rate (partitive division) — and laying the foundation for the algorithm. The students were so attentive and noticing so much. 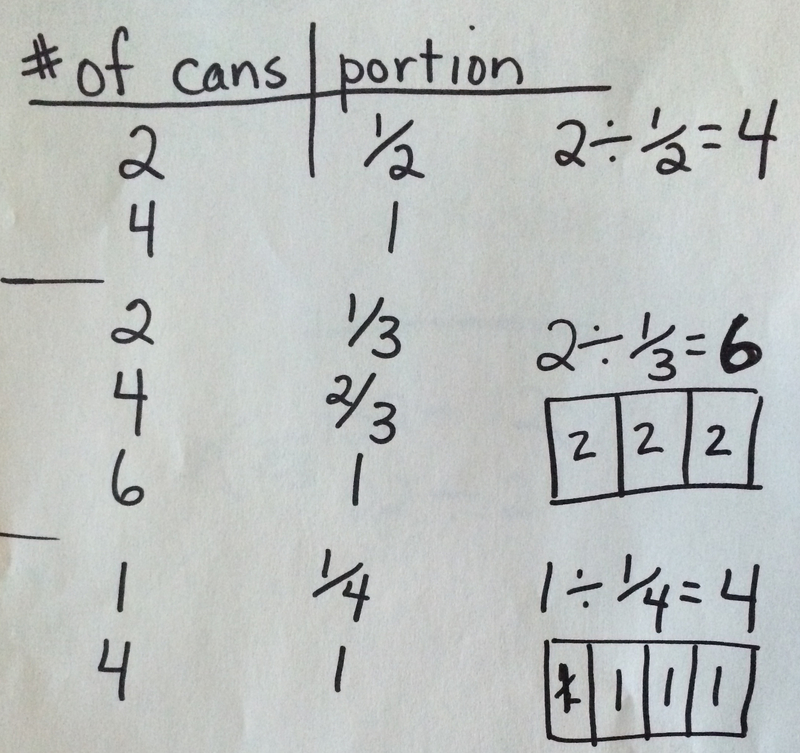 I felt so confident we were on our way to serious sense-making in division of fractions. The string so far had been approximately 15 minutes and it seemed a good place to pause. So I asked a student to restate Pauli and Sammy’s noticing and Hope’s idea and told the class that we’d revisit these ideas next time, along with Erin’s question as to why this happens. I have just discovered numberstrings.com and love it! But I have a question about the mentioned string. I search for strings under division and currently it’s the first one that pops up. A friend used 2 cans of paint to cover 1/2 of the room. At this rate, how many cans of paint will it take to paint the whole room? I totally understand how students automatically said 4, but what I don’t understand is how this represents a division problem of 2 divided by 1/2. I interpret this division expression as “How many 1/2’s are in 2?” But I can’t for the life of me figure out how that question relates to the question of how many cans of paint will it take to paint the whole room? Yes, it gives you the answer, but what about the context should lead me to write a division problem? You are thinking about division only as quotative or measurement division. Here, we are using partitive or rate/ratio division, which is a vital shift that you must make to support kids to think flexibly, and to have a robust understanding of what division means. 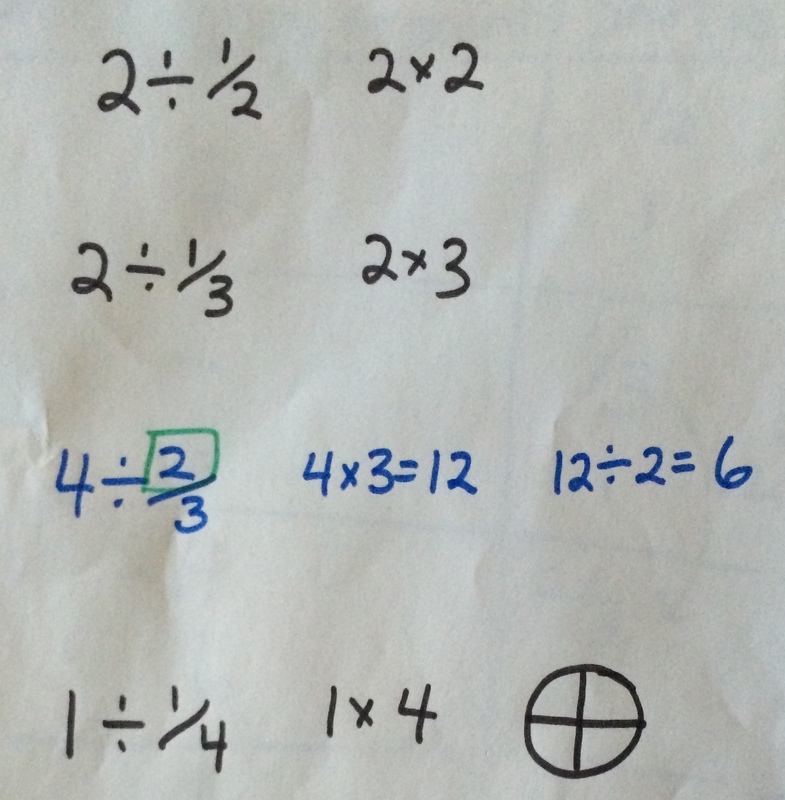 And yes, this model often better supports students to think about how division and multiplication are related. Here division is seen as a rate or ratio that can be scaled up or down to make easier of friendlier equivalent division problems. 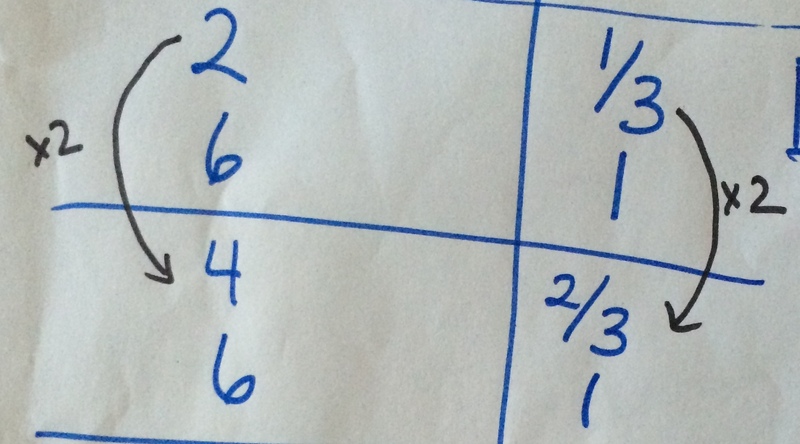 It is essential to kids’ understanding that they are exposed to both models of division: quotative (measurement) and partitive (rate/ratio/fair sharing) division. For more on this we recommend Young Mathematicians at Work: Constructing Fractions, Decimals and Percents. Or write us if you have more questions! Robyn, I have exactly the same questions as you. I can’t wrap my head around how this context leads to the division expression. I see it much more easily as a proportion problem. Yes, division can/should also be conceived of as a ratio or rate and that’s the central idea here. See our response to Robyn and happy to support you in any way we can. Robyn, I had the same question as you for several years. I just couldn’t see the connection between the division equation and the context. But it wasn’t until today – when I just dove in head first and actually did this string with my classes of 5th graders that I finally understand where the connection is happening. 2) Between the multiplication expression and the equivalent division expression. 2 cans of paint for 1/2 of the wall — my kids came up with the multiplication equation 2 x 2 = 4. But then someone also remembered the problem we did before (4 half dollars equals 2 dollars) and mentioned the equation 2 ÷ 1/2 = 4. 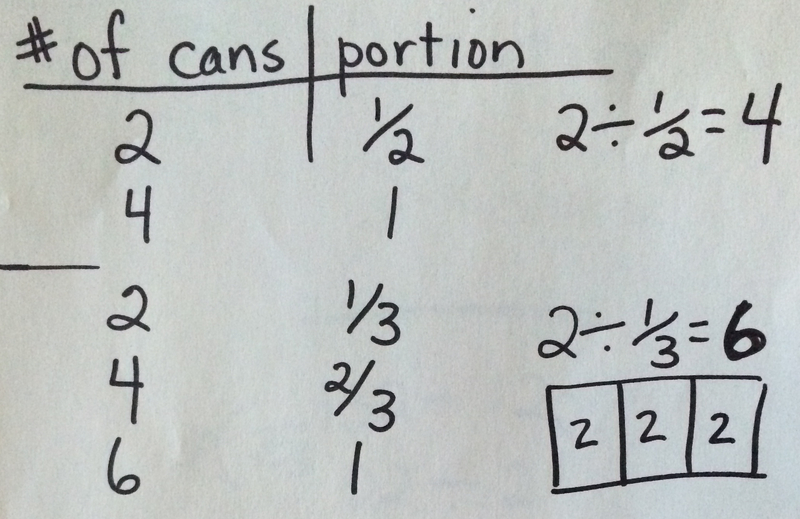 1) connect context to multiplication equation – there are 2 equal sections of the wall and each needs 2 cans of paint, so 2 x 2 = 4 cans of paint for the whole wall. 4 ÷ 2/3 = 4 x 3/2 . –> then some of them connected it to the algorithm they have learned from their parents. Then someone told us how they were taught it was like Kentucky Fried Chicken (keep, change, flip) and we all laughed. But I think this string really does get to an understanding of invert and multiply. One of my favorite strings yet! !